The degree in which Latin America ignores (and I assure you that it is intentional) the menace of Islamic terrorism impresses me. I’ve for some time been translating news which prove that this menace truly exists. This work of mine gave as result an article which appeared in an Argentinean website (informereservado.net), and on which I was attacked and called “The crusader of the XXI century), and also a “menace for the progressivist governments of the region”. Well, leaving compliments aside, the information is being ignored, and those stirring up these issues are generally classified as holders of preconceptions and conspiracy theories. The magazine VEJA issued some denunciations in the past. However, the Islamic community did not show even the slightest sign of concern about the presence of extremists in the country, but raised a complaint against the magazine for spreading “preconceptions”. Did they perhaps forget about the AMIA? This is clear evidence that the multicultural Latin America is also subject to Islamic extremism. But the attacks carried out not only by our fellow citizens against the Israeli embassy and the AMIA are not the only cases where Islamic extremists show up on the Latin American and Caribbean stage. Many things have already happened, things which showed that Muslim extremism in Central and South America as well as in the Caribbean is something that could be ignored and treated like a small threat — but tell this to the families whose relatives have been killed by the actions (of the extremists). Leaving these facts in the shadow of disinformation means allowing those forces to gain strength, and after that it could be too late. Therefore it’s up to us, who have no politically correct bounds and have not been brainwashed by the Left, to shine the spotlight on these cases. That’s why I’ll discuss now a very important issue, of which little is known, mainly because I did not find material about it in Portuguese. Let me introduce you to the terrorists of Jamaat al Muslimeen. In 2007, four Muslims were arrested in the USA under charges of terrorism. The police caught them just as they were about to commit a terrorist bomb attack at JFK airport in New York. If we asked about the citizenship of the arrested ones, we might think that they were Afghans, Pakistanis, Iraqis, Saudis, etc… However, three of them were from Guyana, and the fourth was from Trinidad y Tobago. 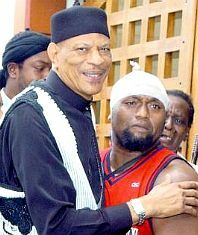 Those involved in this failed terrorist attack were an ex-worker from the JFK, Russell Defreitas, a native of Guyana but with American citizenship; Abdul Kadir, former deputy from the Guyanan parliament and former president of the chamber of Linden, the second largest city in Guyana; Abdel Nur, also from Guyana, and the imam from Trinidad y Tobago, Kareem Ibrahim. In order to carry out the operation, its mastermind Russel Defreitas had the financial support from the radical Sunni group Jamaat al Muslimeen. Jamaat al Muslimeen is a Sunni organization from Trinidad y Tobago formed by Trinidadian black people. It was founded by the imam Yasin Abu Bakr, a former police officer born in Lenox Philip who converted to Islam in the 1980, with the aim of establishing an “Islamic nation” in the Caribbean. The group became known on an international level when they tried to overthrow the government of Trinidad y Tobago through a coup d’état in 1990. More than 100 militants from Jamaat al Muslimeen invaded the parliament and kidnapped the prime minister, and they also occupied a TV network and took all the staff as hostages. The struggle lasted for six days, and while the PM was held hostage under gun point, chaos broke out in the streets of the capital of Puerto Principe, during which 24 persons died. After realizing that they would not reach their goals of taking over power in the country, the Trinidadian Islamists succeeded in forcing the approval of an amnesty for the leaders involved in the coup. They got the amnesty on August 1, 1992, and 114 members of the group were set free. Since then, the Jamaat has been involved in the most important criminal activities in the country. The group has been held responsible for attacks carried out in the capital, apart from running a network of extortion, weapon trafficking and money laundering. The use of violence in order to reach their goals remains their characteristic feature, and they are constantly accused of killing ex-members who were either expelled or no longer shared their ideology. Other Muslim groups such as Islamiyyah Wajihatul, Jamaat al-Murabiteen and Jammat al al-Islami-Karibi also fight for power in Trinidad. All of them are led by former followers of Abu Bakr who either chose their own way or were expelled from the main group Jamaat. This proves that the imprisonment or the death of the Trinidadian leader does not mean the end of radical Islam in the country. The population of Trinidad y Tobago is mainly composed of Hindus and Catholics. There is a small Muslim community, mostly Asians. But Jamaat al Muslimeen draws its support from the even smaller community of Muslims of African origin. During recent years their attacks have been directed mainly against the Hindus, who are in large part members of the Indian community in the country. Abu Bakr still has a great influence both in Trinidadian society and in the politics of the country. In 2002 he put pressure on the government in a display of his power until he was granted the right to explore a mineral-rich plot of land. With this he succeeded in notably increasing the revenues of Jamaat, and he also gave jobs to all of his allies. The Trinidadian government has been taking steps in order to decrease the power of Jamaat; many of its members have been jailed for various kinds of crimes, and its financial power has decreased significantly in the last few years. Imam Abu Bakr himself, the highest leader of the group, is now facing trial on charges of crimes against national security, extortion and others. However, the process had to be postponed because of the state of health of the prisoner. He is 72 years old and suffers from diabetes. He would (have been) be processed on March 5, but he broke his ankle and had to undergo an operation. However, the weakening of the group does not mean that it has ceased to be a threat. Quite the opposite, the attempt to carry out a terrorist attack at the New York airport in 2007 shows that Jamaat al Muslimeen still has full capacity to threaten the peace of the region. When will non-Islamic countries finally "get it" and forcefully but gently repatriate all muslims to their native lands. Western converts can choose to stay but be prohibited from all government employment where security is concerned. My guess is never. No one's got the balls. Interesting! Our late Administrative Assistant was from Trinidad. I went to his funeral at a mosque here in Calgary. Supposedly only one side of the family was muslim but it was interesting there was only a muslim funeral when we were first told that there might be other arrangements, as well. The funeral was horrible most especially because of the Imam SHOUTING, segregation of all us women in the basement behind a screen facing a wall and the sermon was virulently anti-western. I could go on and on.